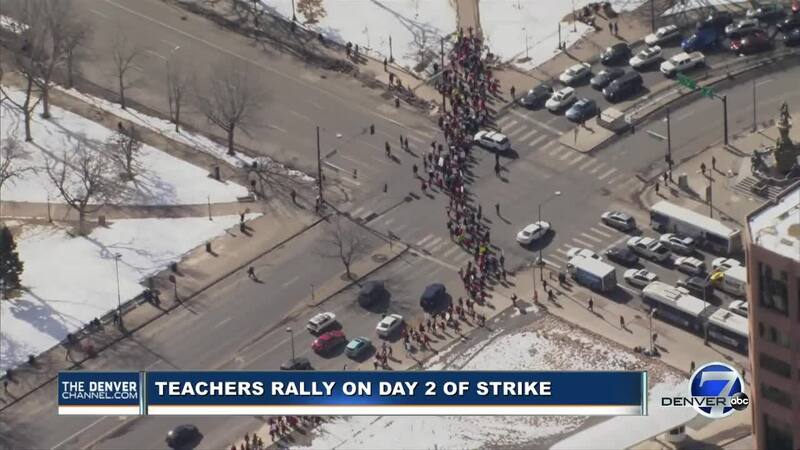 DENVER — The Denver Public Schools teacher strike continues Tuesday morning. DPS and the Denver Classroom Teachers Association will meet at 10 a.m. Tuesday to revisit negotiations. We will post live updates on the strike to this blog. 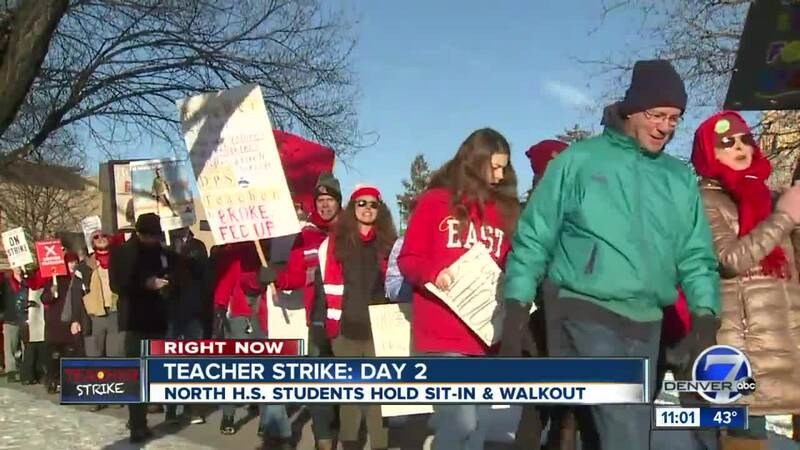 8:56 a.m. — We've started a new live blog for Day 3 of the teacher strike. 12:10 a.m. — A joint statement from DPS and DCTA was released late Tuesday, reading: "Today, Denver Public Schools and the Denver Classroom Teachers Association worked in good faith to find common ground on ProComp. We exchanged proposals that are moving us closer and are hopeful that we will get to an agreement soon. However, we need a little more time to resolve the outstanding issues, and we will resume our negotiations tomorrow morning at 10 am at the Denver Public Central Library. We're hopeful an agreement is reached in order to end the strike, and thank you for your support and understanding." 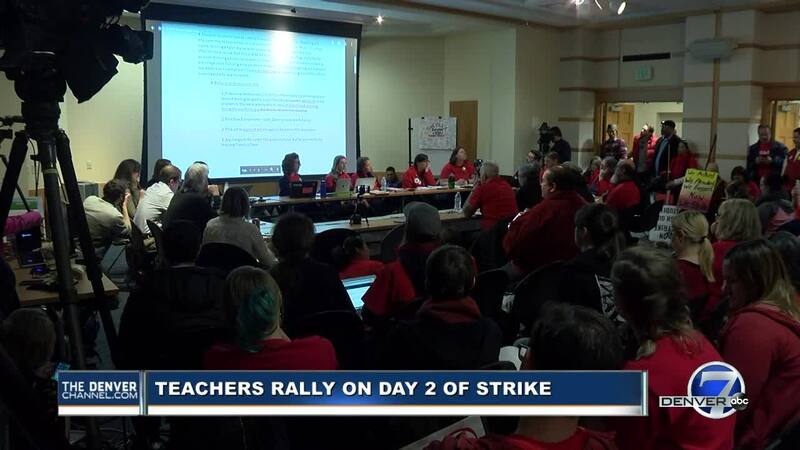 11:00 p.m. — The Denver teacher strike will continue into Wednesday after district officials said they need more time to review the union's counter offer presented during Tuesday's late-night session. Both sides agreed to return to the negotiating table Wednesday morning. 10:30 p.m. — The union is back at the negotiating table working to counter the district's earlier offer. 9:20 p.m. — The Denver Classroom Teachers Association said its members will picket at schools across Denver Wednesday even as a late-night bargaining session between the district and union continues Tuesday. 8:42 p.m. — The union is continuing to work through the district's counter offer but say it's taking time because it’s very complicated. It's unclear how long it will take. We wanted to provide an update on our discussions with the Denver Classroom Teachers Association on reaching a new contract and ending the teacher strike. The two sides have spent the day at the bargaining table, having productive conversations toward an agreement. The talks are still continuing into the evening, and we will continue to provide you with updates. Please check back on DPS' Facebook and Twitter pages for updates throughout negotiations tonight, and we'll share an outcome of the meeting as soon as it concludes today. All DPS schools will be open tomorrow, regardless of the progress of today's negotiations. Preschool (ECE) classes will be canceled again tomorrow if teachers are still on strike. We will notify these families in the event preschool classes resume tomorrow. We appreciate the work and dedication of the staff all across the city who have been critical to keeping our schools open this week. And we also appreciate the support and understanding of our parents and community members. We will continue to provide updates as developments occur. 5:43 p.m. — The city of Denver says it will now keep the Denver Public Library open until 10 p.m. so both sides can try to reach a deal. 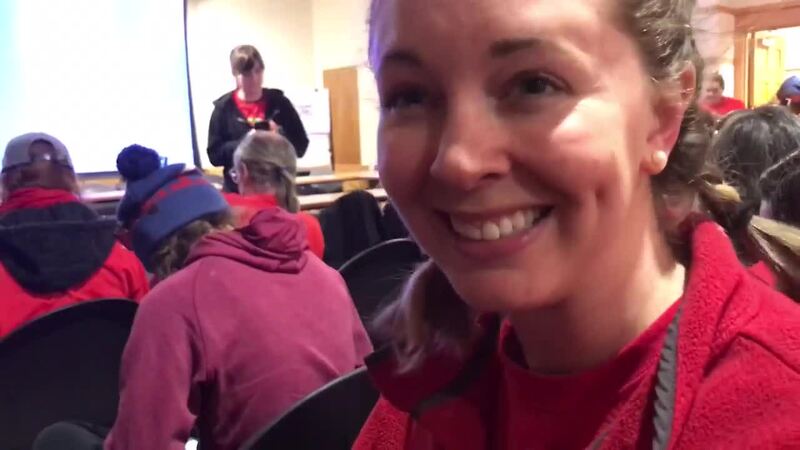 The room they are using had been reserved until 8 p.m.
5:28 p.m. — The DCTA and DPS representatives have returned to the bargaining table after a two-hour break filled with discussions and are back at the bargaining table. 3:26 p.m. — The Denver Classroom Teachers Association has presented its counter-proposal to DPS, and the district is now taking a short break to review the proposal. Watch video of the presentation of the counter-proposal in the player embedded below. 2:53 p.m. — The DCTA has returned to the table with a counter-proposal, which they are expected to present shortly. Watch live in the player embedded below. 2:40 p.m. — As teachers wait to come back to the negotiating table Tuesday afternoon, groups that have arrived at the negotiations from the Civic Center Park rally are back to chanting for better pay. Their latest chant channels Gwen Stefani: "This pay is bananas. B-A-N-A-N-A-S!" 2:15 p.m. — The 30-minute break that the DCTA said it was taking to review the district's latest offer is now going on more than 2 1/2 hours. 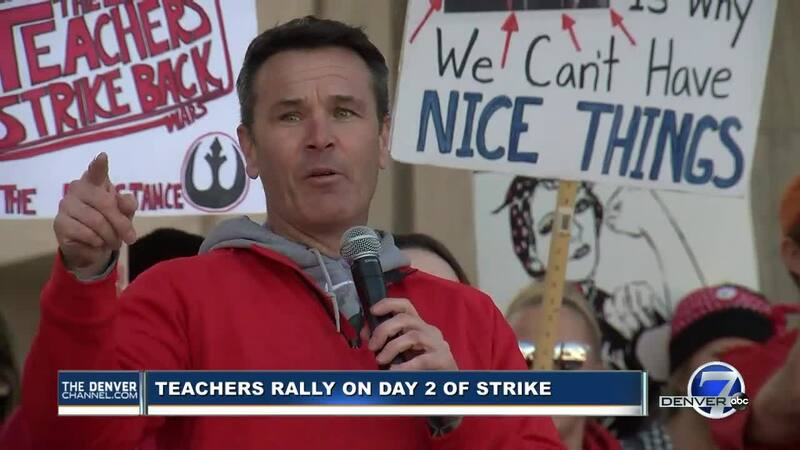 In the meantime, teachers and their supporters held a rally at Civic Center Park attended by more than 100 people and multiple speakers, that included union representatives and Denver teachers as well. Following the rally, teachers were marching through downtown Denver again and were circling the nearby library. 12:45 p.m. — Teachers are making their way from Denver's East High School to Civic Center Park for another rally. Negotiations are ongoing. 12:30 p.m. — Denver7 talked with Emily Taylor, a third grade teacher at Denver Green School, which is an innovation elementary and middle school. She said she has two Master's degrees and she is still confused by the salary schedule. 11:24 a.m. — DPS and DCTA officials spent about 30 minutes discussing how varying degrees would line up with their pay and room for moving up in salary. DCTA asked several questions about the new proposal, which DPS answered and clarified. The group took a 30-minute break around 11:20 a.m. to talk about the negotiations on this aspect. Later today, two other topics — salary schedule and base pay — will be brought to the table. Denver7's Russell Haythorn said based on the people he has talked to, most are still optimistic that they can strike a deal today. DPS's solution regarding salary schedules has been clarified but teachers tell Denver7 that there are still many confusing elements. 10:30 a.m. — DPS and DCTA are coming back to the negotiating table. The groups are once again discussing proposals this morning in an attempt to come to an agreement and end the strike. The meeting is being facilitated by a federal mediator. 7:05 a.m. — DPS and DCTA will return to the bargaining table Tuesday at 10 a.m. DPS Superintendent Susana Cordova said she remains optimistic that they will talk through different perspectives on parts of the contract where there are disagreements. The groups will meet in the basement of the Denver Public LIbrary at 10 W. 14th Avenue Parkway. According to Monday's preliminary reports, 42 percent of the district's classroom teachers in district-run schools reported to work. 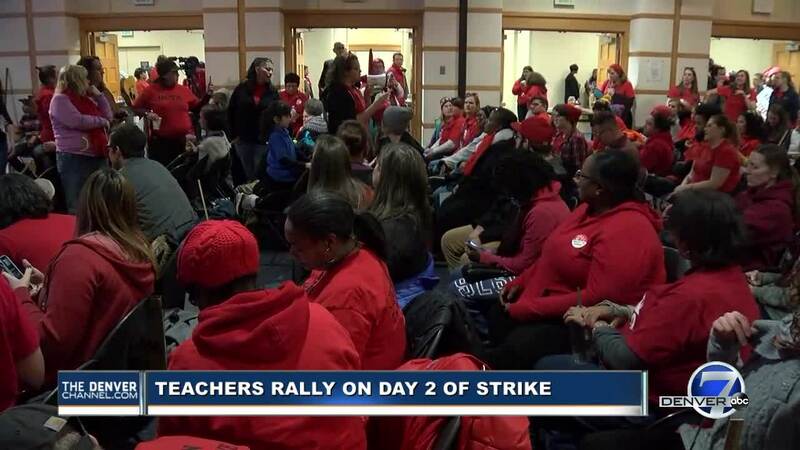 6 a.m. — All schools will remain open Tuesday as day two of the DPS teacher strikes begin.